(Bloomberg) -- Stocks in Europe drifted alongside U.S. equity futures Monday as investors showed caution before the next batch of corporate earnings. Asia shares climbed on strong Chinese economic data, while Treasuries held steady. The Stoxx Europe 600 Index was little changed as gains in banking shares offset declines in food and beverage stocks. Futures on the S&P 500 edged lower. 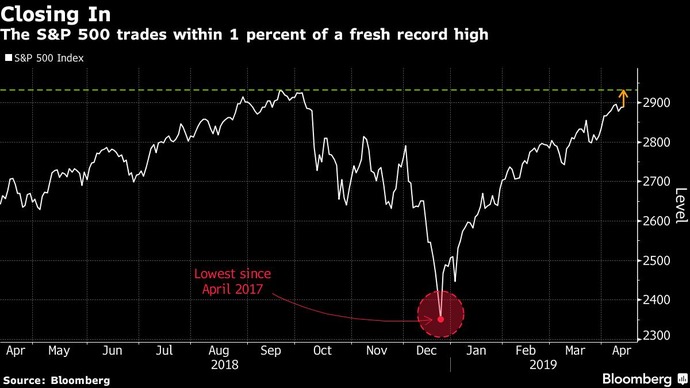 In Asia, equities headed for a fresh six-month high, propelled by markets in Japan, China and Taiwan, after policy makers in Beijing released upbeat credit data. Bullish sentiment also gripped the region after the S&P 500 Index came within 1 percent of a new all-time high on Friday. Oil contracts were steady after crude completed its longest run of weekly gains in three years. With Chinese trade and lending data showing signs of improvement for the world's second-biggest economy, investors are turning to the U.S. earnings season to confirm the resilience of corporate America in the face of numerous challenges to growth. JPMorgan Chase & Co. posted strong first-quarter results. Up next are Goldman Sachs Group Inc. and Citigroup Inc. on Monday, and Bank of America Corp. on Tuesday. "The environment of easier financial conditions is beginning to have an impact on the broader economy," Binay Chandgothia, fund manager at Principal Global Investors, told Bloomberg TV. "If that is the case and growth does pick up, you'll see an uptick in analyst expectations and earnings as well, which should help continue the rally." Central banks remain in the picture, with President Donald Trump renewing his attack on the Fed leadership over the weekend, saying the stock market would be "5,000 to 10,000" points higher had it not been for the actions of U.S. policy makers. Elsewhere, emerging market stocks resumed their rally, heading for the 12th gain in 13 sessions. In currencies, Korea's won jump the most since January. Earnings season rolls on this week, with reports due from: Citigroup, Bank of America, BlackRock, Goldman Sachs, Morgan Stanley, American Express, Johnson & Johnson, Netflix, IBM, United Continental, PepsiCo, Honeywell, Alcoa and Taiwan Semiconductor.The Reserve Bank of Australia releases the minutes of its latest rate-decision meeting Tuesday.Wednesday brings China GDP, industrial production and retail sales data.Stock markets will be closed for Easter holidays in countries including the U.S., U.K. and Germany on Friday. The Stoxx Europe 600 Index fell less than 0.05 percent as of 9:14 a.m. London time.Futures on the S&P 500 Index fell 0.1 percent to 2,910.50.The MSCI Asia Pacific Index advanced 0.5 percent, the largest gain in more than a week.The MSCI Emerging Market Index climbed 0.1 percent.Topix index gained 1.4 percent to 1,627.93, hitting the highest in almost 19 weeks with the first advance in more than a week and the largest rise in two weeks. The Bloomberg Dollar Spot Index fell less than 0.05 percent to 1,192.32.The euro climbed 0.2 percent to the strongest in more than three weeks.The MSCI Emerging Markets Currency Index advanced 0.1 percent to the highest in more than three weeks.The South Korean Won rose 0.6 percent. The yield on two-year Treasuries gained less than one basis point to 2.39 percent, the highest in more than three weeks.The yield on 10-year Treasuries fell one basis point to 2.56 percent.Germany's 10-year yield advanced one basis point to 0.06 percent, the highest in almost four weeks. Gold decreased 0.3 percent to $1,286.64 an ounce, the weakest in more than five weeks.Brent crude declined 0.1 percent to $71.46 a barrel.Platinum decreased 0.9 percent to $890.50 an ounce, the lowest in more than a week. John Gore, the principal deputy attorney general for the Department of Justice's Civil Rights Division, will not appear for a deposition before the Oversight and Government Reform Committee that was scheduled for Thursday, according to a letter from Assistant Attorney General Stephen Boyd dated Wednesday. Ross says he decided to add the question in December 2017 after he learned that the Justice Department might want it included. President Donald Trump has made it clear he doesn't want his subordinates to respond to congressional requests he dismisses as politically motivated. "If the partisan Dems ever tried to Impeach, I would first head to the U.S. Supreme Court," Trump said Wednesday on Twitter, in his latest criticism of reaction to Special Counsel Robert Mueller's findings on Russian meddling in the 2016 election. "There no 'High Crimes and Misdemeanors,' there are no Crimes by me at all," he asserted in a subsequent Twitter posting.